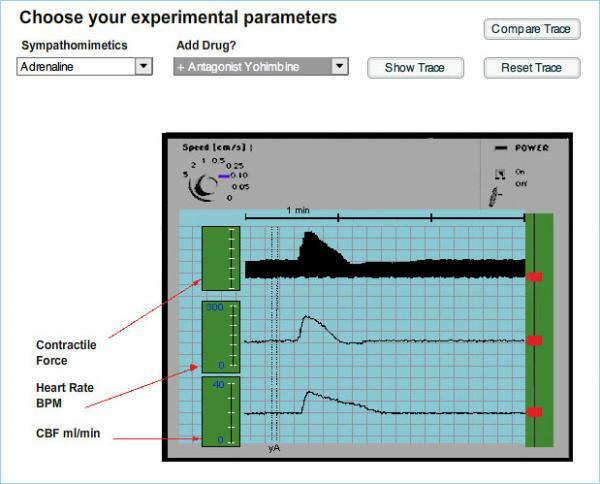 This program is highly interactive and simulates experiments, which may be performed on the isolated perfused mammalian heart (Langendorff preparation). Introduction and Methods sections cover the removal of the heart , setting it up to record ventricular contractile force, heart rate and coronary blood flow and the administration of drugs. In the Experiments section simulated data, derived from actual data, is presented on a screen display which emulates a chart recorder. Students 'design' experiments by choosing, from a menu, a range of pharmacological agents which may be administered either alone, or in combination with an antagonist or potentiator. Each trace represents several minutes of recording and thus allows students to access a large amount of data in a short period of time. A facility to compare traces of 'drug X alone' with drug X + antagonist Y or drug X + potentiator Z is available. This allows easy visual comparison of qualitative effects and of course more accurate measurements can be taken from the screen. 3. effect of increasing pre-load on contractile (ventricular) force (Starlings Law). 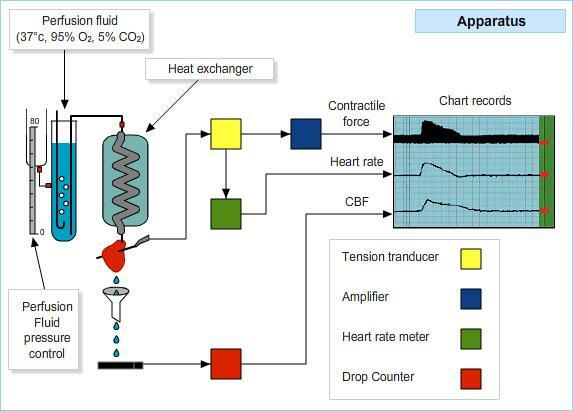 The simulated responses (heart rate, ventricular force and coronary blood flow) are derived from actual experimental data and presented in high resolution colour graphics in a form comparable to that of a chart recorder. The program contains textual information describing the preparation and experimental method and an editable on screen help facility allows teachers to tailor the information-content of the program to specific groups of students. The package also includes suggested student assignments. It is envisaged that the program could be used in a number of ways: to better prepare students who will the perform the practical at a later date; to debrief students after they have performed the practical; as a ‘fallback’ to provide data for students whose experiments were unsuccessful; as an alternative to the practical, though it should be remembered that different learning objectives may be achieved. Target Audience: Undergraduate medical/pharmacology/pharmacy students.